Nothing to do with the game but C7 reported SA receiving some compo but not near enough to the $20k for their lost player to Sydney. South Adelaide will be without luckless utility Nic Schwarz for at least a month with a broken hand. 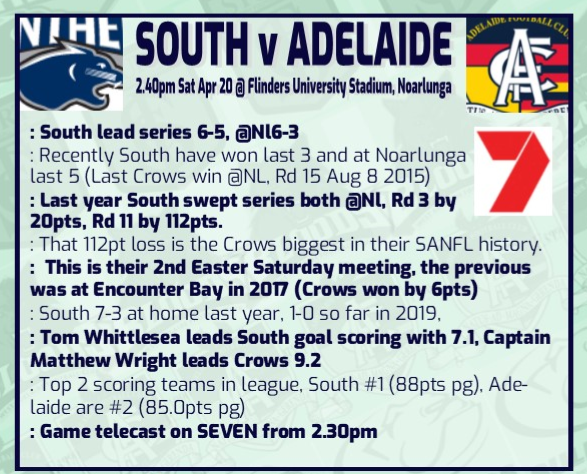 Schwarz, who missed all of last season through injury, will again be sidelined ahead of South’s contest against Adelaide on Saturday. This will ensure one of the Panthers’ three inclusions will make a return to the 21 with Jesse McKinnon, Darnell Tucker and Jaidan Kappler all added to the extended interchange bench. Reliable defender Joe Haines will play his 50th Statewide Super League match. On the reserves bench for AC, Is that player Jackson Press formally from WWTFC. I always rated him and was disappointed when he left. Was in the 2016 GF squad for the Eagles.